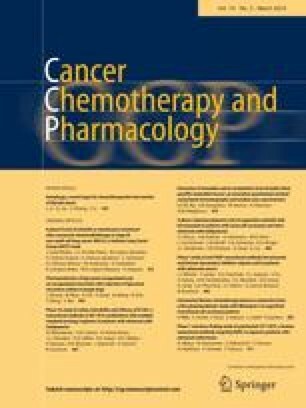 To evaluate whether celecoxib alters the conversion of gemcitabine into its active metabolite, difluorodeoxycytidine triphosphate (dFdCTP), in peripheral blood mononuclear cells (PBMCs). Patients with advanced pancreatic cancer who had not received chemotherapy and had acceptable organ function were eligible for the study. The initial dose of gemcitabine was 750 mg/m2 administered intravenously at a rate of 10 mg/m2/min on days 1, 8, and 15 every 4 weeks. Celecoxib was administered orally at 400 mg twice a day starting 2 days after the first dose of gemcitabine. Serial blood samples were taken during the first and second gemcitabine infusions and the cellular dFdCTP levels from PBMCs were analyzed. Five patients received gemcitabine at 750 mg/m2 and six patients received it at 650 mg/m2. Severe adverse events included neutropenia, thrombocytopenia, enteritis, and gastric perforation. Two patient died early during treatment. Cellular pharmacology studies showed that the conversion of gemcitabine into dFdCTP was not affected by celecoxib. Despite the increased clinical toxicities encountered with the combination, celecoxib did not alter the conversion of gemcitabine into its active metabolites in PBMCs. Gemcitabine 650 mg/m2 infusion over 65 min on days 1, 8, and 15 every 4 weeks in combination with celecoxib at 400 mg twice a day was the dose recommended for further study. The study was funded in part by a research grant from Pfizer. The authors thank Pamela Dumas for excellent research nursing support and Gail Bland for administrative support and editorial comments.